Tom Waldron was born on August 24, 1939, in Sparta, Illinois. He was commissioned a 2d Lt in the U.S. Air Force through the Air Force ROTC program on January 27, 1962, and went on active duty beginning March 9, 1962. Lt Waldron next completed Undergraduate Pilot Training and was awarded his pilot wings at Vance AFB, Oklahoma, in March 1963, followed by KC-135 Stratotanker Combat Crew Training. His first assignment was as a KC-135 pilot with the 321at Air Refueling Squadron at Lockbourne AFB, Ohio, from September 1963 to March 1965, and then with the 32nd Air Refueling Squadron at Lockbourne from March 1965 to July 1966. He served as a KC-135 and EC-135 pilot with the 305th Air Refueling Squadron at Bunker Hill AFB (later renamed Grissom AFB), Indiana, from July 1966 to May 1969, and then completed Helicopter Pilot School and HH-53 Super Jolly Green Giant Combat Crew Training between May and October 1969. His next assignment was as an HH-3 Jolly Green Giant and HH-53 pilot with the 40th Aerospace Rescue and Recovery Squadron at Udorn Royal Thai AFB, Thailand, from October 1969 to September 1970, followed by service as an HH-53 instructor pilot with the Aerospace Rescue and Recovery Training Center at Eglin AFB, Florida, from September 1970 to August 1971. During this time, Capt Waldron served as copilot of the HH-53 "Apple Three" during the Son Tay Raid, a clandestine mission to rescue American Prisoners of War in North Vietnam on November 21, 1970. He then received an Air Force Institute of Technology assignment to complete his master's degree in civil engineering at the University of Missouri from August 1971 to December 1972, followed by service as a civil engineer and Deputy Chief of Operations and Maintenance with the 1st Civil Engineering Squadron at MacDill AFB, Florida, from January 1973 to 1975. He attended Army Command and General Staff College at Fort Leavenworth, Kansas, from 1975 to 1976. LtCol Waldron next served as Commander of Detachment 1 of the 37th Aerospace Rescue and Recovery Squadron at Davis-Monthan AFB, Arizona, from 1976 to August 1978, and then as Plans and Programs Officer in the Bases and Units Division and the Fighter and Reconnaissance Division with Headquarters U.S. Air Forces in Europe at Ramstein AB, West Germany, from August 1978 to August 1980. His final assignment was as Chief of the U.S. Air Force International Standardization Office with the Air Force Element of the North Atlantic Treaty Organization in Washington, D.C., from August 1980 until his retirement from the Air Force on April 1, 1984. 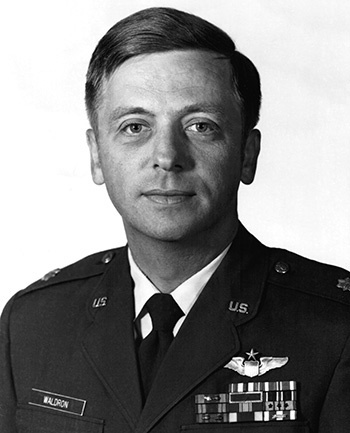 Captain Thomas R. Waldron distinguished himself by gallantry in connection with military operations against an armed enemy of the United States during the Prisoner of War search and rescue operation at Son Tay, North Vietnam, on 21 November 1970. On that date, Captain Waldron, as a pilot of a helicopter prepared to carry out the ground rescue party and freed prisoners, flew deep into the heart of enemy territory in a bold night attempt to rescue American Prisoners of War. His aircraft was the first into the objective area. He took the guard towers and troop billets under intensely suppressive, highly accurate fire. Although exposed to enemy ground fire and surface-to-air missile firings, Captain Waldron successfully penetrated these defenses. With gunners laying down suppressive fire, the United States Army Special Forces were placed in position to assault the camp. With complete disregard for his own safety, he maintained a position to provide assistance and immediate evacuation upon completion of the assault. The personal skill and extreme courage displayed by Captain Waldron in this very hazardous rescue attempt contributed immeasurably to the ultimate effectiveness and tactical success of the mission. By his gallantry and devotion to duty, Captain Waldron has reflected great credit upon himself and the United States Air Force.